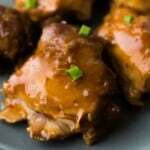 Sticky slow cooker honey garlic chicken thighs are simple to throw together and have a deliciously sticky sweet and savory sauce that is perfect for spooning over rice and vegetables. Perfect as a weeknight dinner or meal prep recipe. 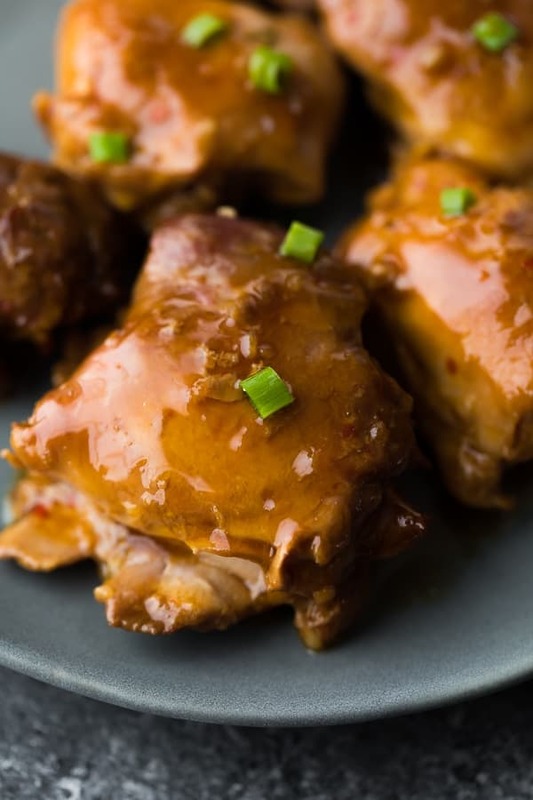 When it comes to chicken, nothing beats a deliciously sticky sauce, right? This slow cooker honey garlic chicken has a sticky sweet and savory honey garlic sauce that gives the chicken so much flavor, and is perfect for spooning over rice and veggies! And the surprising thing is that it has pretty ‘normal’ ingredients that you probably already have in your pantry. 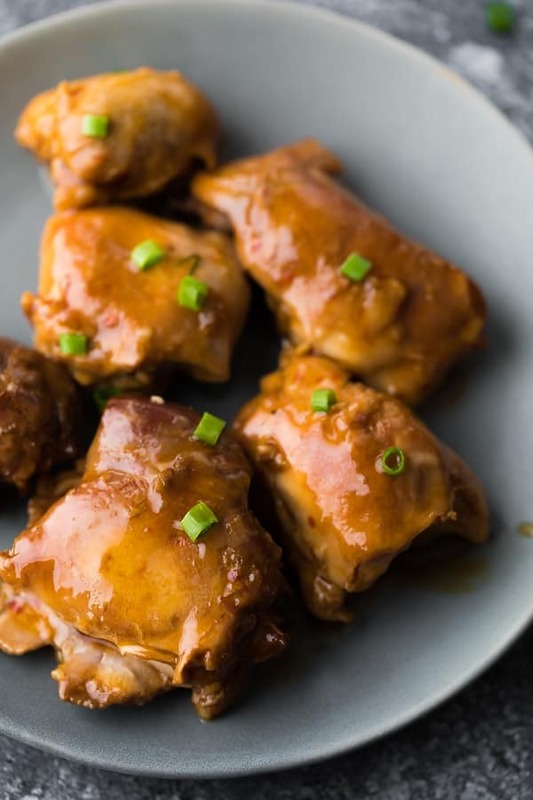 Not only that, but by using boneless skinless chicken thighs and using only a teaspoon of oil, this honey garlic chicken recipe is actually on the healthier side! 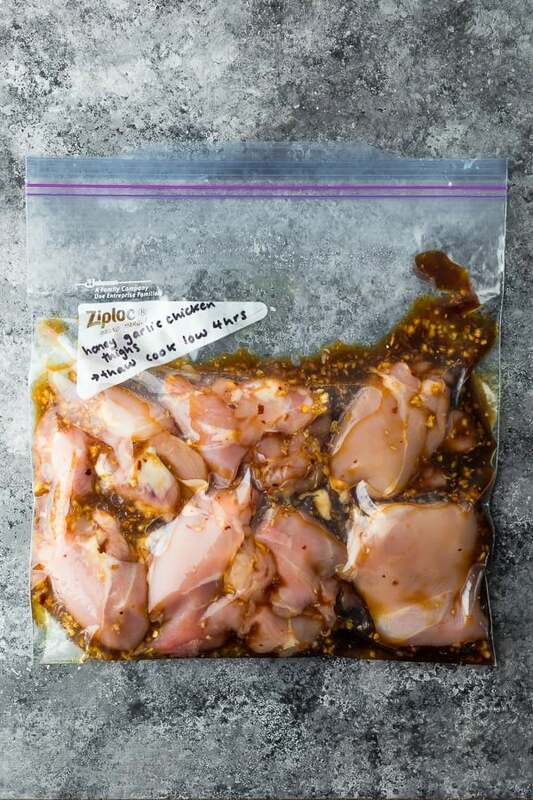 Assemble the boneless skinless chicken thighs and all other ingredients in a gallon-sized freezer bag. So incredibly simple! When you’re ready to cook, you will need to thaw completely before placing everything in the Crock Pot and cooking as directed. Like the majority of my slow cooker recipes, this one has no pre-cooking whatsoever. That means all you need to do is assemble your ingredients in the slow cooker, press start, and walk away! boneless skinless chicken thighs- I prefer chicken thighs in the slow cooker as they don’t tend to dry out and they hold together a lot better. Bone in should be OK in this recipe, but skin on will end up with a very fatty honey garlic sauce so I don’t recommend it. garlic- LOTS of it! 6 cloves minced, and you can even add more if you’d like! Worcestershire sauce- because the sauce needed a little more pizzaz and this was totally the missing ingredient! 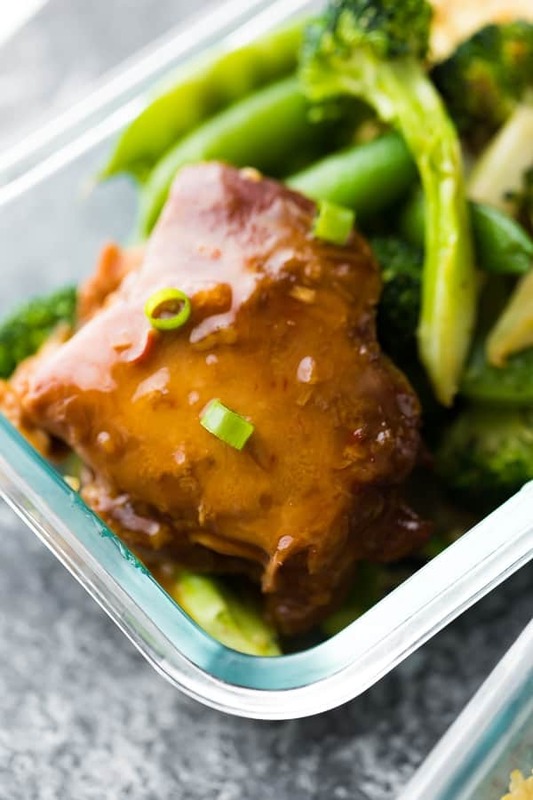 Not only were these Crock Pot honey garlic chicken thighs delicious as a weeknight dinner, but they made for a ridiculously delicious meal prep lunch option as well! 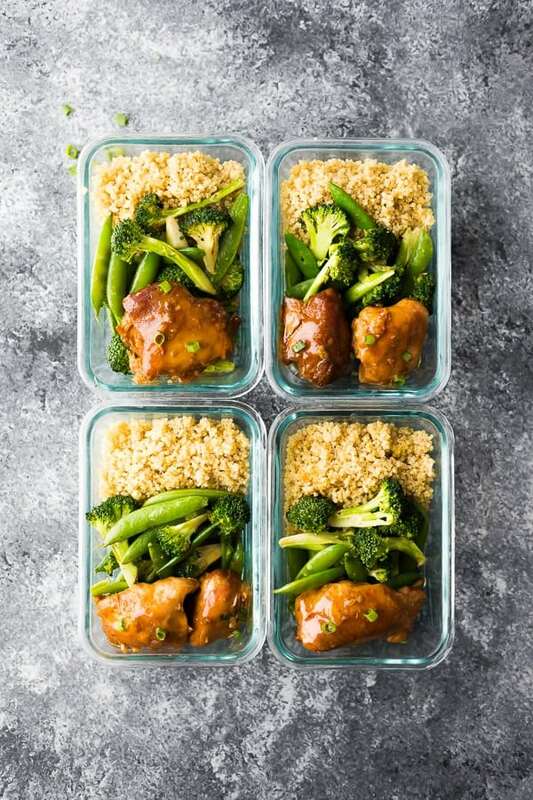 I served my sticky honey garlic chicken thighs with sauteed broccoli and snap peas over a scoop of quinoa. Delish! 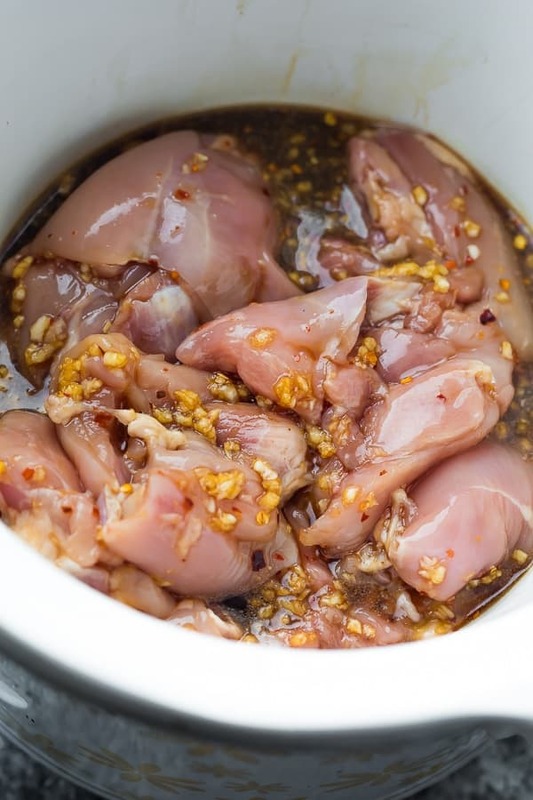 How can I make this honey garlic chicken paleo/gluten-free/in the Instant Pot? swap the boneless skinless chicken thighs for boneless (or bone-in) chicken breast. Just be cautious not to overcook!
. I am not sure if it would cook the same in a larger 5 quart crockpot, it may cook quite a bit faster and you will need to keep an eye on it to make sure the honey garlic sauce does not burn. Place all ingredients not marked 'after cooking' into the base of a 2.5 quart slow cooker. Mix together the water & cornstarch, then stir into the slow cooker. Turn the heat to high and cook for 30 more minutes, or until thickened. Serve over rice, spooning the sauce over everything. Garnish with green onions. Place all ingredients not marked 'after cooking' into a gallon sized freezer bag. Squeeze out as much air as possible, and freeze flat for up to 3 months. To cook, thaw completely before cooking according to directions above. This recipe was updated on 01/2019 to address issues with sauce thickening and increase the flavor. Though this hasn't been tested, this recipe should work in the Instant Pot. I would recommend cooking on high pressure for 10 minutes before releasing the pressure. Add the cornstarch & water and cook on the sautee function for a few min until thickened. I made this recipe exactly as stated. My sauce didn’t thicken at all and the liquid was no good anyways. I ended up eating the chicken plain with rice and I thought it was an OK recipe. Hi Catherine, I just retested this recipe a few weeks ago and my whole family enjoyed it, including my picky 5 year old, so I don’t really get your review. If your sauce didn’t thicken, sounds like you didn’t leave it on high for long enough. This is a staple in our house! We absolutely love it! Even my picky kids will clean their plate. Thank you for the recipe! I’m so happy you enjoyed it, Sara! Thanks so much for taking the time to leave a review! I’m about to try this, but you say about 1.5 pounds of chicken thighs or 10 of them. You must have skinny chickens, four of mine weight 1.8 pounds. Let’s hope for the best. Hi Mark! Yes, they are boneless and skinless, so they’re pretty small! Hope you enjoyed! My sauce didn’t thicken up as much as I would have liked and wasn’t really as flavorful as I expected. I feel the same way. Not what I was hoping for at all. Thanks so much for your feedback, Jodi & Erin! I have updated the recipe to address the sauce thickening issue and to increase the flavor. My 5 year old had seconds he loved it so much! This was terrific and fast! Made it in a crock pot and followed directions as written. My non-chicken liking teenager devoured it and asked for the leftovers to be put in a quesadilla today. Thanks so much for a fantastic recipe that I could whip together and get into the crock pot in about 15 minutes. can’t wait to try more of your recipes! I’m so happy you and your son enjoyed! Thanks so much for your review, Lisa! Hi! This recipe sounds amazing! I am out of corn starch. Is there a substitute for it? Most of the other recipes call for 1/2 cup of Ketchup. Would adding this help, or hurt your recipe? Hi Rick, I really can’t say because I have only tried as written. Can I cook this on high in my crockpot? Hi Kathleen! So for this recipe I haven’t tried, I *think* it would be OK on high for 3 or so hours, my only concern is that the honey may burn, so I’d keep an eye on it. Let me know if you try it! I’m out of apple cider vinegar. Is this a deal breaker. I have plenty of other wine vinegars. Is there a substitute? Hi Kathleen! It should be OK without it, just adds a little bit of tangy flavor. You might be able to do rice vinegar, but I haven’t actually tried this. In crock now, added extra water, brown sugar and broccoli! Will let you know how it turns out! Did in a bigger crock than 2.5 and I am cooking on high for 4 hours at least until I see I need to add water or something. I made this chicken tonight and my children even asked for seconds and they are NOT good eaters. My husband raved about this dish and all the pots are empty. I made it in a pot on the stove and cooked the chicken for about 1.5 hours on kind of a low/medium heat. Then grilled the chicken to brown it a little bit on the skin. This is definitely in my favourites recipes. I want to try this in my Instant Pot… I’m just trying to figure out the cook time! Hi Cassie! I’d try 10 minutes for boneless skinless chicken thighs and 8 min if you use boneless skinless chicken breasts. Hope you enjoy!